What is the Insight Technology? A computerized, non-invasive & painless test consisting of thermal, surface electromyology (SEMG), and heart rate variability (HRV). The benefits of these scans are to detect and pinpoint abnormal function which cannot be seen on X-ray and are generally not felt in the form of pain until the damage is severe; Much like a heart attack. The scans will show if there is any Subluxation (stress) on your nervous system and how it is affecting your organs, glands, muscles & energy level (FUNCTION of your body/nervous system). Does the Insight Technology test hurt? Absolutely not. These tests do not utilize any needles, electric shock, or heat whatsoever. The patient just feels someone touching their spine. Even infants and pregnant Moms-To-Be can be scanned. The scanning technology DOES NOT emit any radiation or dangerous signals. Lifestyle stress and subluxations affect the balance of the Autonomic Nervous System and impact a patient’s ability to adapt. Heart Rate Variability (HRV) testing is today’s gold standard to analyze the overall effects of stress and anxiety in patients of any age. Research has concluded that lower and unbalanced HRV readings can be improved dramatically with chiropractic care. Our doctors have joined a growing number of high tech chiropractic doctors that have upgraded their level of care to better assess the health and well being of their community. People can now be examined by the InsightTM Technology, a non-invasive technology which is a neuro-spinal screening and evaluation system originally designed to measure changes in the spinal muscles of astronauts caused by space flight. It is painless, economical, and only takes minutes. Our doctors use the InsightTM technology to help measure subluxations, which is a nerve interference along the spine. This nerve interference disturbs the muscles regular nerve function, causing an abnormal amount of electrical flow to the muscles and create other health problems. 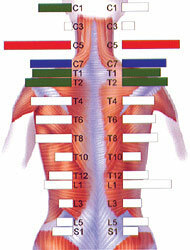 The InsightTM technology measures the electrical flow and charts it, using graphics that show the spine. This helps specify precisely when chiropractors should adjust their patients, allowing for increased accuracy in diagnosis, treatment, and outcomes. To have an evaluation with the Insight Subluxation Station, contact one of our Elevate Chiropractic care coordinators.